One of my favorite things to happen is when clients become life-long clients and friends. I adore capturing moments from engagements to families, and everything in between. Watching my clients love and family grow, is just my absolute favorite! I first met Heidi and Chad in July of 2014. Chad is actually a customer of my fiance, Adam, at his work. When Adam heard that Chad proposed to his girlfriend, Adam mentioned me and the rest you say, is history! Chad contacted me, and I met with him and Heidi soon after. I immediately loved their personalities and style, and was more than excited when they booked their wedding with me. 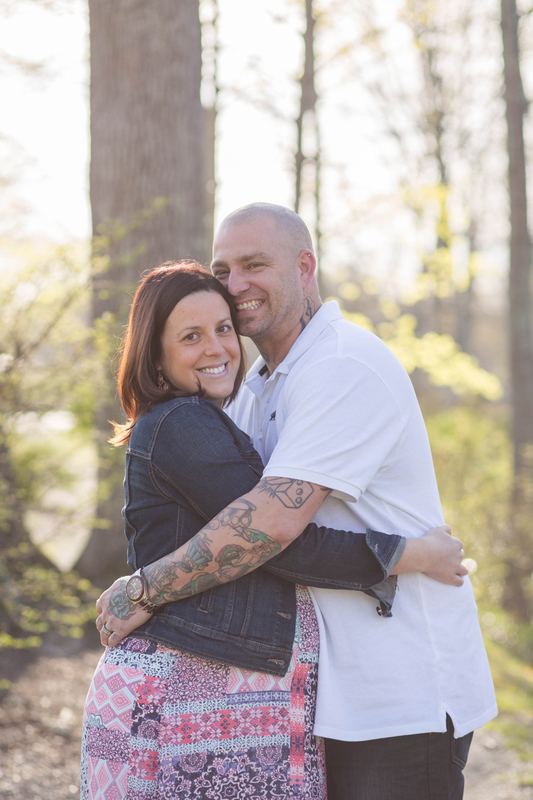 I photographed their engagement session in September and their wedding was in August of 2015. Not long after, Heidi told me her and Chad were expecting and I grew so excited for them! Heidi and Chad are some of the sweetest people. Their wedding day was beautiful, and it's one I often look back on and adore. I was more than honored when they booked me again to capture this maternity session. Heidi is glowing, and looks so beautiful, despite being almost 9 months pregnant! They are expecting a baby boy, and I can not wait to meet the little nugget and photograph him soon. Watching this family grow, and being able to capture them along the way, will be fantastic! I photographed Heidi and Chad just two weeks ago, at one of my favorite local parks. It was a beautiful day, and the waterfall at the park was flowing so strong, it was the perfect backdrop for some of these images. I brought along a maternity dress, to show off that beautiful bump, and growing belly. Heidi and Chad brought a beautiful book, with baby Sawyer's name on it. We had such a wonderful day, and I just love these images! Here are some of my favorites from their session!